A nice 5.56 round for function testing, target and training use for the 5.56x45mm caliber. This is a perfect choice for those who are breaking in a new firearm or who need to overcome heavier spring installations due to the hotter load and the increased powder charge. Originally designed as a law enforcement load for practice use and eventually adopted into the mainstream shooting market due to the excellent performance in the law enforcement range round use. 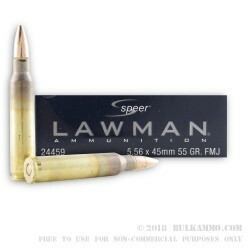 Speer is a preeminent provider of law enforcement training and duty ammunition and has been able to make some solid innovations on the back of that data collected at the law enforcement level. It has led to Speer becoming one of the best personal protection and range use ammunition suppliers on the market because of their excellent understanding of the needs of shooters who are doing those activities. 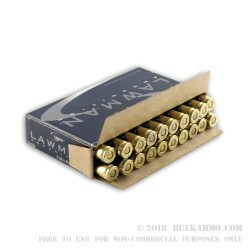 This is a 5.56x45 load, and generally is not suitable for use in the .223 Remington because of the excess pressure standard. 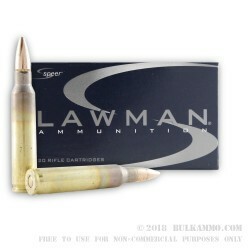 The annealed case throats, excellent quality brass and Boxer primer make this a great donor cartridge for the reloader. The 55 grain projectile is widely compatible with most barrel twist rates without serious degradation to the accuracy of the round.